There’s no better body of knowledge than history when identifying the right buildings, neighborhoods, cities and even countries to invest in, especially when your scope is 13,000 years. 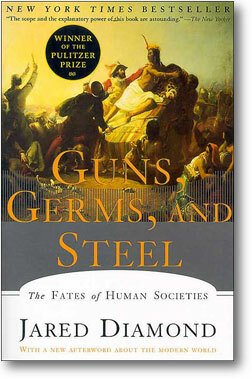 That’s what biologist, physiologist, and biogeographer Jared Diamond provided in his mind-boggling Pulitzer Prize winner, Guns, Germs, and Steel: The Fates of Human Societies. Not that anyone can condense 13,000 years into a 400-page into fleeting blog entries, but here are the basics as best as I can summarize, and definitely in my view as it relates to investing in the right place at the right time to rejuvenate a neighborhood’s economy and quality of life. – While the earliest human remains were found in Africa millions of years ago, populations didn’t grow substantially until humans reached Europe and China, where the seeds of basic crops and domesticated animals far outnumbered any other region in the world. Both are necessary to support significant populations. – The east-west axis of Eurasia allowed seeds and animals to multiply across the same latitude (from Europe to China), which is extremely prohibitive across the severe weather/season/terrain changes when moving along the north-south axis continents of Africa and the Americas. – We don’t prepare raw chicken with our salad for a reason – major human diseases originate from animals. This allowed ancestors of Europe to build up an immunity to diseases over thousands of years, allowing them to ‘conquer’ the Americas by passively wiping out 90% of their populations by disease alone. – Europeans and the Chinese also were technologically advanced, especially in weaponry (swords, guns) and transportation (ships). Tens of thousands of Incas didn’t stand a chance against a hundred Spaniards when they first encountered one another. Thankfully in a global economy perhaps things are a bit more civilized. The question is, how can we learn from history? How did seeds and crops transform populations into technologically-rich societies? Studies prove the Spaniards weren’t any more inherently intelligent than the Incas, just historically geographically fortunate. But China’s ancestors had the same head start. Why didn’t they ‘conquer’ the Americas ‘first’? That’s really awesome. Haha. Wow!